Everyone who are familiar with part of or the full primary series is welcome to the workshop. We start Wednesday 17th of July 7am with a led primary class for all participants. Participating on the led intermediate classes Friday, Saturday and Sunday 8.30am requires that you have been taught at least till Eka Pada Sirsasana by a KPJAYI authorized or certified teacher, see the list. 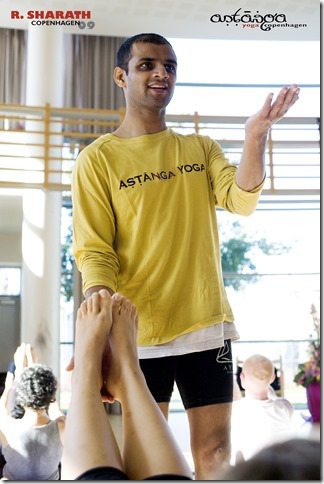 Sharath requests the right to stop anyone not performing an asana sufficiently. You are required to participate all 3 days – no drop-ins. Contact Susanna if you have questions about the practice. All classes will take place in DGI-byen – map. Please read the advices to the classes under Guidance. Every Morning you will need to show your entrance card upon arrival to the hall. We don’t re-issue lost cards – keep it safe!